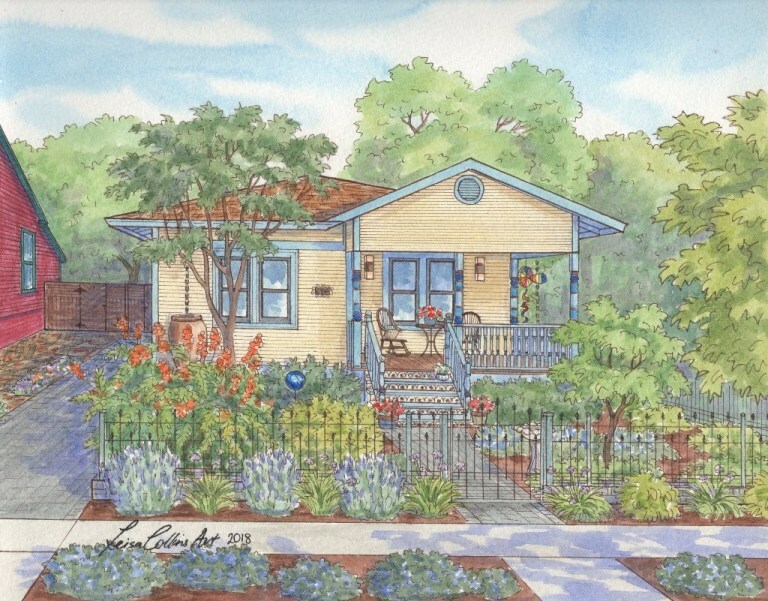 Artist Leisa Collins has a passion for historic homes and buildings. She’s gained national recognition through her extensive travels and has painted close to 2,000 architectural subjects in all 50 states. Today she receives requests from around the country for paintings of homes and historic buildings, and has a following of realtors who give her original house portraits as closing gifts to their favorite clients. Leisa, Please share your story with us, How did you get to where you are today? St. Louis — Leisa Collins, an acclaimed national artist who specializes in paintings of historic homes and buildings, presented two individuals in Benton Park with her latest Leisa Collins Historic Preservation Award for their stellar actions to save and fully restore two pre-Civil War cottages that had been abandoned for over a decade. Awardee, Ray Simon, an architect and noted rehabber in Benton Park, had the vision to rescue the two crumbling relics on Missouri Ave. Together with partner Mel, they transformed the fading structures into what is often described as one of the coolest properties in the neighborhood. TARPON SPRINGS – Nationally acclaimed artist Leisa Collins selected Dunedin resident Joseph Kokolakis, president of K.J. Kokolakis Contracting, as the recipient of the Leisa Collins Historic Preservation Award for his work on saving a Ring Ave. bungalow from ruin. The event was hosted by marketing and public relations specialist, and friend to Collins, Gracia Bennish. The craftsman-style home is at 108 N. Ring Ave., though that is not its original location, according to Phyllis Kolianos, vice president of archives at the Tarpon Springs Historical Society and a member of the Pinellas County Historic Preservation Board. Beautiful buildings, many owned by regular folk, and others by “heroic” property-owners, who’ve painstakingly restored often decrepit but historic houses, have been at the center of Leisa Collins’ around-the-world and grand artistic adventure. Having now created house portraits in 46 states and in 35 different architectural styles — Craftsman bungalows, Victorian, Tudor and other historic homes — Collins’ work reflects an architectural tour of buildings across America. One of my good freelancer friends recently moved with her family from Falls Church to Vienna, but they took a piece of their old house with them in the form of a beautiful watercolor sketch, which is now a lovely reminder of all their good times there. Architectural paintings can be so much richer than photography—there’s something about the paint strokes that gives them personality and character. That’s why I was excited to learn about Leisa Collins, an artist who splits her time between DC and California. She’s painted homes all over the DC area, and is in the process of developing a book of her architectural paintings from all 50 states. Think your house is an unlikely subject for a painting? Think Again. Artist Leisa Collins is a fan of strolling through Glendale neighborhoods, but she has an even bigger fondness for architecture that will occasionally stop her right in her tracks. When she comes across a visually-striking home, she whips out a drawing pad and starts to sketch. On Saturday a celebration was held on the new site of a very old Monrovia Carriage Barn. Several years ago, the barn was threatened with destruction when the house with which it was associated was sold. Through the efforts of the Monrovia Historic Preservation Group (MOHPG), the carriage barn was saved. 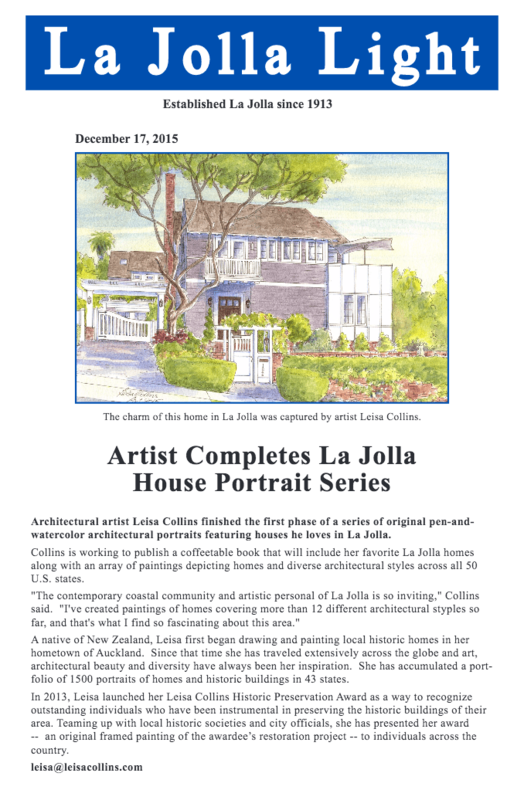 Posted Tuesday, June 16 – 9:19 a.m.
South Pasadena artist Leisa Collins recently completed the first phase of her San Marino series of pen and watercolor house portraits. She noted San Marino has its own ambiance with no apartment buildings and few commercial establishments. SOUTH PASADENA – Amid widespread indignation over “mansionization” sprawl, one local artist has found a unique way to preserve prized architectural homes in the San Gabriel Valley. Though it may go relatively unrecognized, the city of South Pasadena is comprised of homes with exclusively individual architecture. Professional artist Leisa Collins is one resident who utilizes this subtle quality to her benefit. 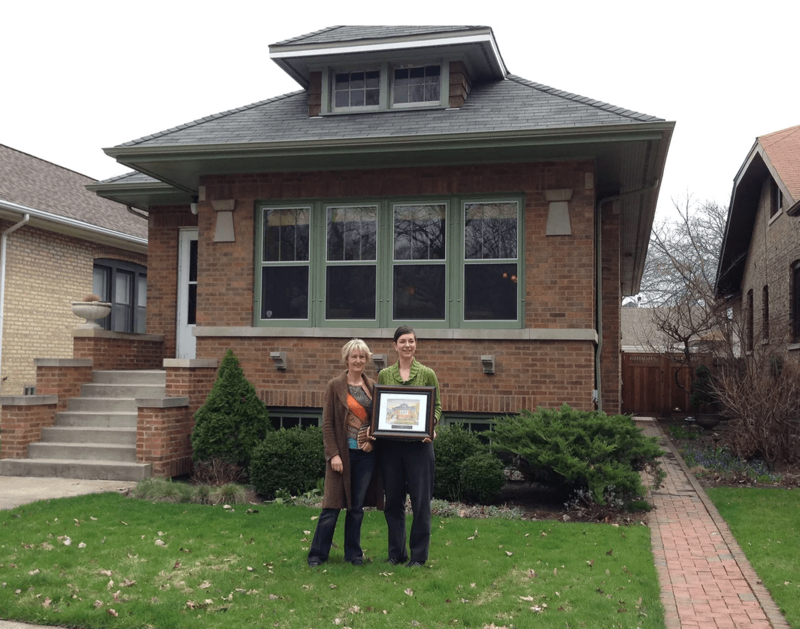 We would like to extend our congratulations to Julie Liska, Historic Chicago Bungalow owner and preservationist, who was nominated for the Leisa Collins Historic Preservation Award. Woodbine’s own Zell Millard was awarded the Leisa Collins Historic Preservation Award for his efforts to rescue and preserve the Merry Brook Historic School House. The award was presented to Millard at the school by the international artist Leisa Collins herself who is a native of Auckland, New Zealand. Creative Art Nexus encourages community participation in public art projects. Its creation resulted from many youth groups and professional artists who joined together to complete a mural in Alexandria in October 2010. Today, when Camille Leverett was sworn in as a member of the Alexandria Commission For Women and Leisa Collins as a member of the Alexandria Commission for the Arts, their business and community service partnerships officially merged. Leverett owns BeautyFull Boutique, the City’s only consignment shop catering to plus-sized women, and shares space with Collins, an accomplished artist and owner of studio/workshop Creative Art Nexus. A public mural appears to be coming to the Mount Vernon Recreation Center in Del Ray, but not before the project is discussed and public comments are collected. The Del Ray Mural Youth Project, which is to coincide with next month’s Art on the Avenue festival, proposes a temporary art piece to be painted on the exterior wall of the recreation center’s gymnasium. Local artists Leisa Collins, Corinne Marlowe, Forest Allread and five youth teams will help construct the mural during the festival on Oct. 2. After relocating to Old Town Alexandria three months ago, artist Leisa Collins noticed a lack of young people involved in the historic and restoration movement and decided to do something about it. Artist Leisa Collins was travelling with her husband across the country from the West Coast, searching for a new place to live, when they took a wrong turn and ended up at the foot of Duke Street and Old Towns waterfront. With decades of service to the community, and hundreds of talented individuals under its wings, the arts scene in Alexandria is quite impressive. In this setting, it takes a lot for a newcomer to make a mark. With her own deft touches, newcomer Leisa Collins is doing just that. Visual artist Leisa Collins stopped in at the Mt Cook-Aoraki village recently as part of a national painting tour in which she is retracing the footsteps of her journey through the South Island 30 years earlier. When artists converge on Aoraki Mt Cook this week, Gemma Hart-Hobman will be in their thoughts. A splash of colour and generous strokes of aroha were the finishing touches of a painting crated through a youth programme at Tapuihikitia Marae, Puha, last week. Artist and activist Leisa Collins stopped by Sacramento on Sept, 13 as part of a 6,000-mile tour around the U.S. She held painting lessons at the Capitol to protest the cuts to arts education in the latest California budget. She’s shown here with student Sara Benassini of Carmichael and her painting of the Capitol. Photo by Bruce Goodman. After two decades spent in social activism and traveling the globe, artist Leisa Collins is once again focusing on art. The New Zealand-born artist is traveling across the country as part of her new “Across the USA: Through the Eyes of an Artist” tour. Collins stopped near the western rim of the Grand Canyon in early September after leaving from Los Angeles Sept. 3. Her tour will end at the end of the month in New York. Capturing the “places, faces and homes of America on camera and on canvas”, Mammoth Lakes was one of the first stops of the Across the USA from the Eyes of an Artist tour. Capturing the “places, faces and homes of America on camera and on canvas”, Yosemite National Park was one of the highlights of the Across the USA from the Eyes of an Artist tour and the subject of an open air painting session on the shores of Lake Tanyere. The journey marks the re-emergence of visual artist Leisa Collins into the art world after two decades of global travels and social activism.